It is a well known fact that concrete is one of the toughest materials to work with. When it comes to cutting concrete roads, powerful tools are required to ensure that the cutting is done in the right manner. There used to be a time when people had to cut through concrete using only chisel and hammer as most of the power tools were not easily available. However, cutting concrete roads has become far easier these days as power tools can easily penetrate through concrete. When it comes to concrete road sawing, there are a lot of concrete road sawing tools available in the market. There are basic concrete road saws that are used for cutting flat work. There are also wire saws, handheld cut-off saws as well as chain saws. 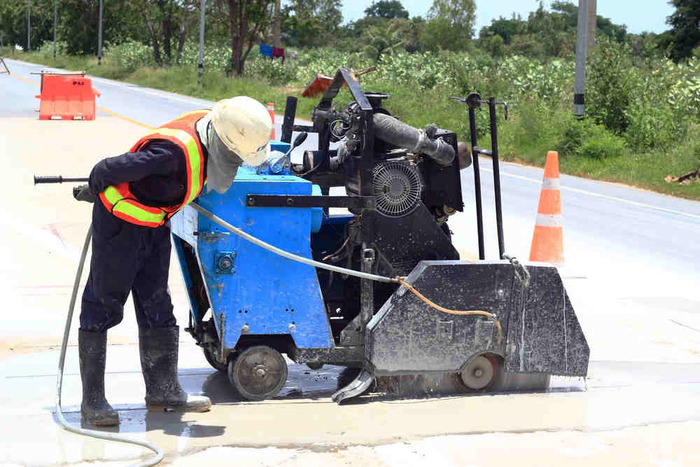 It is important to realise that a concrete road saw is a very powerful tool. Therefore, it needs to be handled in a safe manner. It may look like any other power tool to an observer. However, people who actually handled road saws understand that even a minor mistake poses a big danger to them as well as people near them. All of the saws available in the market including the road saws come with standard safety instructions. It is important for any operator to follow these instructions at all times. It is essential to ensure that the guards are always well maintained and positioned in the right manner. Also, the blades should always be tight and straight. Needless to say, you must need to use the right blade with the saw. Below are some essential precautions that you should follow to acquire optimum safety when handling road saws. One of the biggest dangers in cutting concrete is the generation of silica dust. When concrete is cut with an abrasive blade or a diamond blade, it generates very fine dusts. Some of these fine dusts contain silica dust. Silica dust is very dangerous as it is fine enough to be drawn deeply into the human lungs. If you inhale high quantity of fine silica dust, it may cause silicosis. Silicosis is a lung disease that causes lung fibrosis and there is no known cure for this. Quite a few construction workers lose their lives every year due to silicosis. Therefore, it is important that the person who is cutting concrete on a regular basis should protect himself from silica dust. It is important to keep silica on the ground and prevent it from becoming airborne. If it is not possible to keep silica on the ground, then workers should use respirators to breathe. However, wet saws or other types of vacuum systems can prevent the silica dust from getting into the air. Blade is the most important part of a concrete road saw and also the most dangerous. Almost all of the concrete cutting saws make use of diamond blades as these cut much better than the abrasive blades and these are affordable these days. The most important thing about blades is that you need to choose the right type of blade for your particular sawing job. There are both wet and dry blades available in the market and it is essential to ensure that wet blades are used with water. Dry blades can be used with or without water. Since concrete is a very tough material, blades can get damaged on a regular basis. It is recommended to have a careful look at the blades before you start cutting with those blades. Since these blades are rotated at a very high speed, it leads to generation of a lot of heat. It is possible that already damaged blades may eject hot steel pieces that can cause injury to the operator of the saw or anyone who is standing nearby. Therefore, it is important to check that there are no damaged segments and there are no cracks in the blade. Also, you need to get a new blade if it seems that the blade has been overheated. The term kickback is used to refer to the event when the cutting saw jumps back towards the operator. There can be many causes of kickback. Usually, it happens when the operator tries to put the blade into a cut that is already started without the blade spinning at the top speed. Therefore, it is essential to make sure that the blade in the saw is at top speed before putting the blade in an existing cut. On the other hand, lock in happens due to shifting of the work piece. Therefore, one needs to ensure that it is properly clamped to prevent any lock in. It is essential to wear safety glasses while cutting concrete. Also, a respirator is required when cutting dry concrete. You also need to protect your ears and therefore, ear plugs or earmuffs should be used. Overall, concrete road saws are very powerful tools that allow one to work efficiently. However, it is important to take safety precautions seriously to prevent any kind of unfortunate incidents while working.